Valentine’s Day is almost here, so very soon the air will be filled up with love, joy and sweet words. To make this day even more glorious and memorable, all you need to do is to look appropriately. By that I mean a special kind of outfit that will provide yourself and everyone around with the positive mood and great inspiration. Rocking a cute dress and doing your hair in romantic curls will dog by all means good, however this would not be enough to reach the desirable effect. Therefore, I suggest that you take a look at the below images and enjoy the lovely accessories. What you will find in this post will definitely make your mouths water. If you went for a moderate dress and are now looking for a proper footwear piece to style it with, here is your chance to shine and glow. 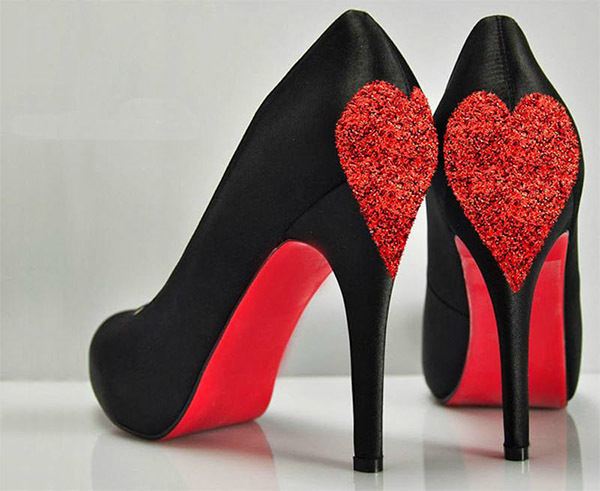 This pair of pumps in black feature one of the most cute and romantic designs ever. What if not a large embellished heart on the back can bring more of the love mod into this already sweet and bright holiday? I bet you won’t be able to stay in a shadow with such hotties embracing your precious feet. Besides, due to the classy main color, you can rock these shoes with whatever you want. Depending on your preferences and style of the look you can choose from the wide range of earrings presented on the image below. Be it a pair of rose-shaped cuties in lust red or silver earrings designed as two arrows, your Valentine’s outfit will only benefit from such a delicate and exquisite accessory. 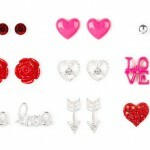 Moreover, you can expand your search and find a matching ring or else a bracelet that would complete the saucy ensemble. Tights represent a very important element of woman’s wardrobe, but for some reason ladies tend to underestimate it. This pair is definitely something that can make up your day. 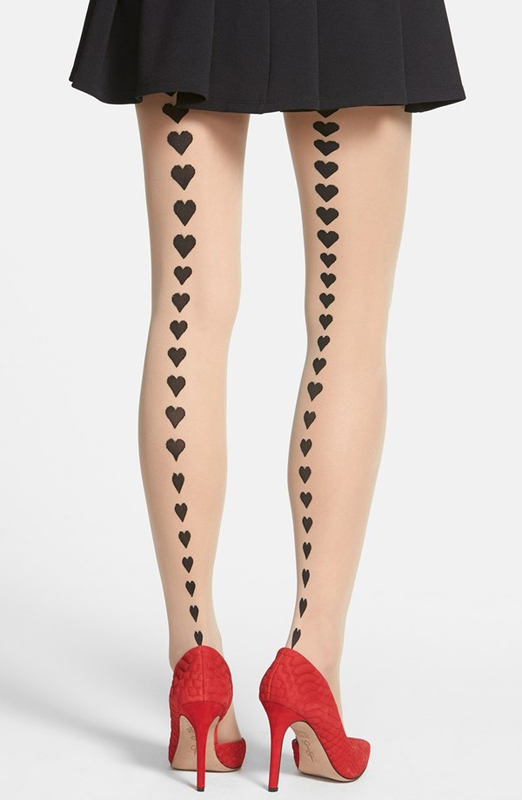 All you need to complement these sheer tan tights with symmetrical rows of black hearts is a short skirt, lovely top and a pair of high heels. Trust me, with such styling you will stay in the limelight and become the queen of the night for sure. There is no a single outfit in this universe that could be complete without a proper handbag. Be it a large tote or a petite minaudiere, ladies need this kind of accessories almost like they need air or water. This is why the designers around the world keep releasing so many of the striking pieces that offer a wide range of options. 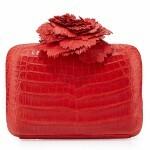 In this case it is a beautiful and very stylish clutch that we are talking about. 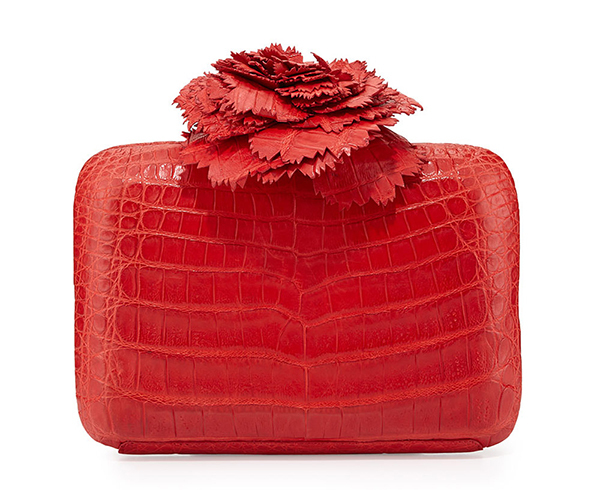 The deep red shade makes it almost impossible to not fall for the piece, while the python leather as well as the oversized embellishment on the top adds more glam to the item. Statement necklaces will never fade away. No matter what other jewelry trends the fashion houses share with us, we still tend to fall for every second statement necklace that we spot. This was exactly the case when I saw this adorable piece that perfectly fits into the concept of Valentine’s Day. Moreover, this stunning item can be also rocked on any other occasion, so getting such a design would be quite a rational deal. The black and gold combination is offset by the vibrant red hue in a gorgeous way. The lips-shaped pendant looks extremely appealing, bringing an edgy zest into the image. 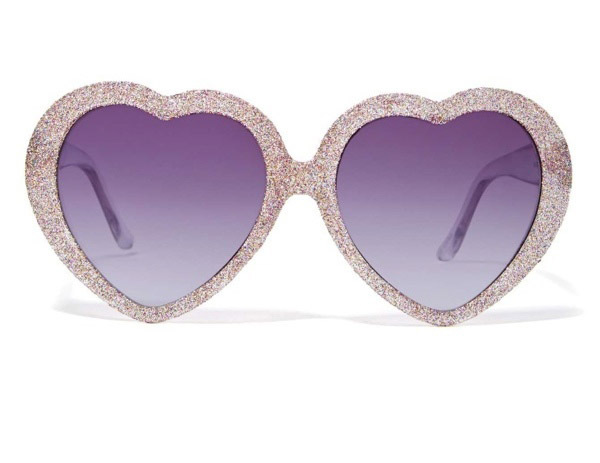 These loveliest sunglasses will definitely speak to many of you. 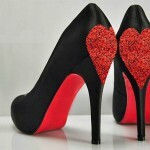 The heart shape makes this pair an excellent one to wear on Valentine’s day. 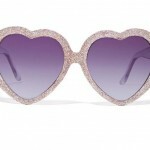 The delicate shade in violet as well as the exquisite embellishment makes this pair glitter and shine. So if you are looking for something that would help you stand out from the crowd not only on this holiday but afterwards as well, this is the best accessory to go for ever! Head pieces must be worn on any holiday. When it comes to such a romantic and beautiful one, every lady has to come up with something to decorate her hair. You don’t have to check out a thousand malls to find your piece. A plain flower tucked into your hair will do good. 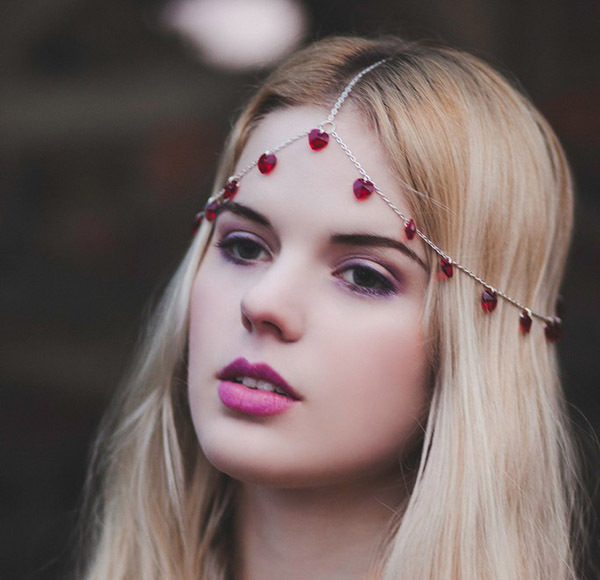 However, if you are willing to create an engaging and super saucy ensemble, then you might need something like this astonishing headwear piece in silver and red. 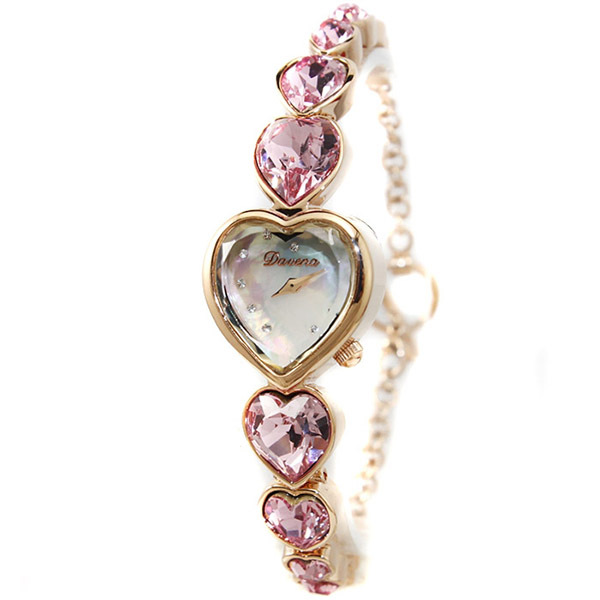 The delicate and very thin chain is complemented by tiny hearts in wine red. All together the item loos super exquisite and elegant, so it is definitely worth being tried on. 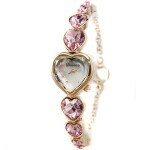 An elegant watch is something that any lady will find it hard to resist. For one thing, with such a watch one won’t need any bracelets to wear, so you can simplify your accessory search just in one single step. Also, wearing a watch tends to give a person a businessman-like feeling, so it also contributes to your confidence-building. 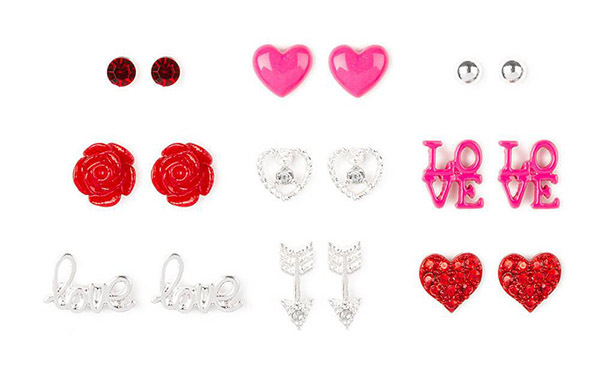 These were the coolest and hottest accessories that you can rock on Valentine’s Day.